From Goodreads: Scarlett has never left the tiny island where she and her beloved sister, Tella, live with their powerful, and cruel, father. Now Scarlett’s father has arranged a marriage for her, and Scarlett thinks her dreams of seeing Caraval, the far-away, once-a-year performance where the audience participates in the show, are over. But this year, Scarlett’s long-dreamt of invitation finally arrives. With the help of a mysterious sailor, Tella whisks Scarlett away to the show. Only, as soon as they arrive, Tella is kidnapped by Caraval’s mastermind organizer, Legend. It turns out that this season’s Caraval revolves around Tella, and whoever finds her first is the winner. Scarlett has been told that everything that happens during Caraval is only an elaborate performance. But she nevertheless becomes enmeshed in a game of love, heartbreak, and magic with the other players in the game. And whether Caraval is real or not, she must find Tella before the five nights of the game are over, a dangerous domino effect of consequences is set off, and her sister disappears forever. Thoughts on the Novel: Normally, when I see a lot of buzz for a book, I try to avoid reading it until the hype dies down so that I’m not as influenced by others’ feedback. 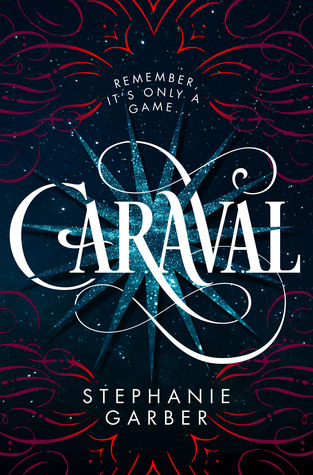 As a result, I didn’t bother reading Stephanie Garber’s Caraval until recently. The setting in Caraval was mysterious and enchanting, making it hard to figure out what was real and what was imaginary. Furthermore, the writing in Caraval was very flowery, enhancing the magical, dreamlike vibe of the book. Where Garber lost me as a reader though was with the lack of character development. Not only did the secondary characters feel like actors at times - I now understand why - but I struggled to like Scarlett. She constantly talked about loving Tella, but it wasn’t evident how much her sister meant to her until the end when everything was revealed at once in a poorly executed dramatic moment. Instead, for the majority of the book, Scarlett seemed more fixated on lusting after two different boys. Caraval was released by Flatiron Books in January 2017. Comments About the Cover: I love the colours used and how nicely they contrast against the background. Sorry to hear you didn't love this! This was an enjoyable read for me but the hype defs ruined it for me a little because I expected WAYYY too much from it! I have this one on my tbr because of the hype, but after reading lukewarm reviews I think I will skip it. I've realized that I'm not a big fan of circus books. I did find it to be an overall enjoyable read (love all the twists), but I feel the exact same way about the lack of character development! Plus, with the way it ends, it seems as if there will be a second book but from Tella's POV. This didn't excite me in the least. I really didn't get any sort of connection to Tella's character at all. Bummer, this totally seemed like it would have been a "me" book. And I still think it would be as I love magical dreamlike vibes, if not for the lack of the connection to the MC. I recently finished Strange the Dreamer, which was similarly enigmatic and dreamy but with a great MC, so I would recommend that one. Once the hype dies down for it of course! I have been seeing so many mixed reviews on this one. But the under developed characters seems to be a common theme is most people's reviews. I think I may skip this one. I feel like it would probably put me in a slump.